Your Palm device can hold only a fraction of the information your desktop computer can. To save space on the Palm device, clearing things out regularly is a good idea. The Palm device has a Purge function in the Date Book and To Do List that automatically gets rid of unneeded items and moves them to an archive file, if you want. 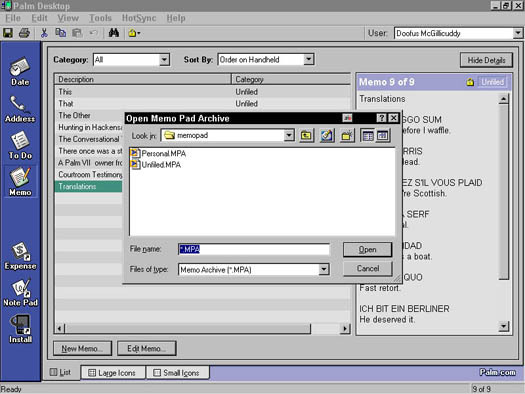 The Palm Desktop is the only place where you can open and view archived items. Even if you use another personal information manager, such as Microsoft Outlook or Lotus Organizer, to put items into your Palm device, you still need to look in the Palm Desktop to view your archived items. 1. Choose the type of archived item you want to look at from the buttons on the left side of the screen (or from the View menu). Calendar items are archived separately from items deleted from the Address Book, To Do List, or Memo Pad, so you need to open the part of the Palm Desktop that handles the type of item you want to see. 2. Choose File –> Open Archive from the menu bar. The Open Archive dialog box opens, as shown in Figure 1. Figure 1: Find those old, deleted files by opening an archive file. 3. Click the name of the archive file you want to view. Usually, only one file appears on the archive list. If more than one archive file is listed and the archive you open doesn’t contain the item you want, repeat Steps 2 and 3 until you find the archive containing the item you want. The items in the archive you picked appear as a new list of items on your Palm Desktop. If you’re looking at the archive of items assigned to categories, the archive files are organized by category — personal, business, or other category. Another benefit of keeping archive files is to help you get back items you accidentally delete. Don’t be embarrassed — it happens to everybody. 1. Choose the type of archived item you want to recover from the buttons on the left side of the screen (or from the View menu). Pick either Date Book, Address Book, To Do List, or Memo Pad. The Open Archive dialog box opens. The file you click is highlighted to show you selected it. The items in the archive file you picked are listed on the Palm Desktop. 5. Click the item you want to have returned to your Palm device. The item you click is highlighted to show you selected it. 6. Choose Edit –> Copy from the menu bar (or press Ctrl+C). The item is copied to the Clipboard. Nothing happens on the screen. 7. Choose File –> Open Current. Your collection of current items appears. 8. Choose Edit –> Paste (or press Ctrl+V). The item appears as part of your collection of current items. 9. Place your Palm device in its cradle, and press the HotSync button on the cradle. The HotSync dialog box opens and shows the progress of your synchronization. The whole reason for archiving items is to save space on your Palm device — so don’t load old items back on your Palm device unless you really need them.